With two litres, four cylinders and six gears, this model has enough firepower to blow any competition out of the water and takes the title of the fastest, most powerful MINI ever. As the next-generation model, this cars 2.0 litre turbo charged TwinPower engine has been granted the full John Cooper Works tuning treatment to deliver a whole lot more power and much more torque than any other MINI of its kind. 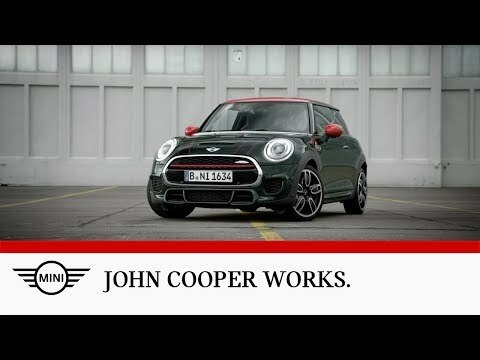 Producing 320Nm of torque from lower in the rev range, the John Cooper Works Hatch makes for effortless acceleration enjoying the race from 0-62mph in just 6.1 seconds and allows the car to tear up the tarmac at a top speed of 153mph. This models exterior physique contributes to its aerodynamic performance by way of a redesigned front bumper and extended lower air intakes and mesh to match the main grille while the great deal of dedication that has gone into the engineering of this cars somewhat beautiful body is evident in the multilink rear axle that offers optimum traction, the sharpened sports suspension, the cars high torsional strength and the 335mm front brake discs with Brembo 4 pot front brake callipers. To add the finishing external touches, the car features a John Cooper Works spoiler, sports rear bumper and a distinct central twin sports exhaust tailpipe, amplifying the adrenaline-fueled, rip-roaring sound. On the inside, the car contains an ergonomic interior that includes sports seats with integrated headrests, sporting side bolsters with an optional quilted effect, John Cooper Works sill finishers that trim the doors, and a red-thread handstitched steering wheel. The cars speedometer with tacho marks around the LED ring adds further detail to the rev counter function while the optional Head Up Display now also includes rev lights and gear information, all contributing pleasantly to the perfect cockpit feeling!